The adventure began with Giotto almost 150 million km from Earth. 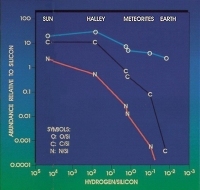 At 21:00 UT on 12 March 1986, the spacecraft's instruments first detected hydrogen ions 7.8 million km from Comet Halley. 22 hours later, Giotto crossed the bow shock of the solar wind (the region where a shock wave is created as the supersonic solar particles slow to subsonic speed) and entered the dusty coma. At this point the camera was switched to tracking mode to follow the brightest object (the comet nucleus) in its field of view and began to send the first, fuzzy images back to Earth. Excitement rose at the European Space Operations Centre in Darmstadt, Germany, as the stream of pictures and data came in. Located in adjacent rooms, each of the ten experiment teams scrutinised the latest information and struggled to come up with a preliminary analysis. The first of 12 000 dust impacts were recorded 122 minutes before closest approach. Images continued to be transmitted as Giotto closed in to within a distance of 1372 km, but the rate of dust impacts rose sharply as the spacecraft passed through a jet of material which streamed away from the nucleus. Only 7.6 seconds before closest approach, the spacecraft was sent spinning by an impact from a 'large' (one gram) particle. Monitor screens went blank as contact with the Earth was temporarily lost. TV audiences and anxious Giotto team members feared the worst, but, to everyone's amazement, occasional bursts of information began to come through. Giotto was still alive. Over the next 32 minutes, the sturdy spacecraft's thrusters stabilised its motion and contact was fully restored. By then Giotto had passed within 596 km of the nucleus and was heading back into interplanetary space. The remarkably resilient little spacecraft continued to return scientific data for another 24 hours on the outward journey. The last dust impact was detected 49 minutes after closest approach. The historic encounter ended at 02:00 UT on 15 March when Giotto's experiments were turned off. "We discovered that a comet is not really a 'dirty snowball' since dirt is dominant, not ice," said Horst Uwe Keller of the Max Planck Institut für Aeronomie, Katlenburg-Lindau, Germany. "Instead of being spherical like a warm snowball, a comet nucleus is elongated. The physical structure of a comet's interior is defined by its dust content rather than its ice content." Altogether 2112 images were returned before communications were disrupted. 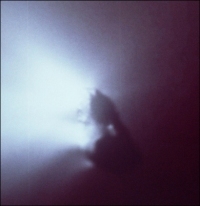 A unique series of images sent back by the spacecraft revealed the comet nucleus to be a dark, peanut-shaped body, about 15 km long and 7 to 10 km wide. At least three bright jets could be seen spewing out material from the warmer sunlit side, but only about 10% of the surface was active. Detailed analysis of the data confirmed that the comet had formed 4.5 billion years ago from ices condensing onto grains of interstellar dust. Since then, it has remained almost unaltered in the cold, outer regions of the Solar System. Two major classes of dust particles were found. One was dominated by the light 'CHON' elements - carbon, hydrogen, oxygen and nitrogen. The other was rich in mineral-forming elements - sodium, magnesium, silicon, iron and calcium. All of the comet's light elements (except nitrogen) were found in the same relative abundance as for the Sun. This means that Comet Halley consists of the most primitive (i.e. original, unprocessed) material known in the Solar System. The data from the plasma and ion mass spectrometers indicated that the surface of Comet Halley is covered in a layer of organic (carbon-rich) material.